Making my own gifts is not something I normally do. Honestly, I’m the first to fire up the internet and order something. Easy and quick. Once in a while though I’m inspired to come up with something personal…something that may not be the most expensive gift but more of a keepsake. 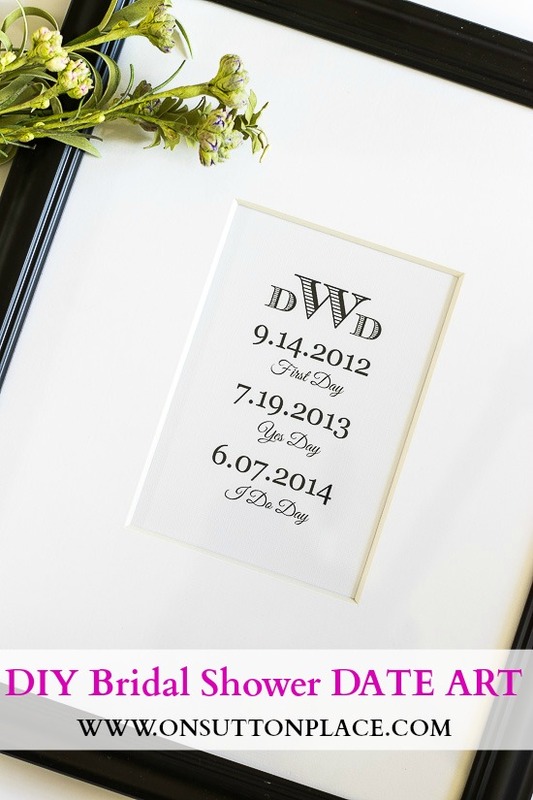 This DIY Bridal Shower Date Art is a perfect example. The daughter of a good friend is getting married in June and we recently celebrated her bridal shower. I contributed to a gift with another friend that was on the bride’s registry. A great gift but not very personal…it was one of those lovely stainless steel trash cans. Even though I know the bride wanted it (who wouldn’t?) I felt like adding a little something of my own. It was very simple. I designed the text in PicMonkey. I got a black frame (aff. link) and I already had the mat from another project. I used textured card stock to print the dates. It was a fun project and the bride loved it. After she opened it, she got tiny tears in her eyes. That warmed my heart more than anything else. Wrapping it was fun as well. 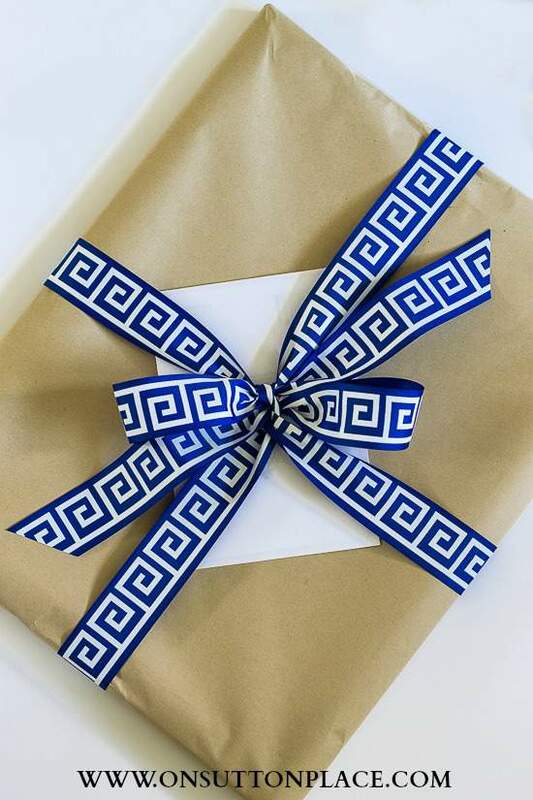 I always use brown kraft paper and jazz my gifts up with ribbon. This ribbon is stunning and came from Hobby Lobby. One of my all-time favorite videos is from Eddie Ross and it’s called All Wrapped Up. It’s old, from 2008, but he shows you how to wrap a present with one continuous piece of ribbon topped with a bow. Very fun. I am taking a few days off from the blog to get some items listed in my shop. I have things started but not one thing is finished. Also…I’m not saying it very loud but I think spring may have sprung. Finally. See you soon! Ann, what a wonderful, personal gift that will be treasured for many years to come! And the ribbon on the gift is so YOU! Enjoy the purr of your machine and warmer weather! I always enjoy reading your blog, Ann. You have fabulous ideas! Wonderful idea, great execution, too. You are so talented, your posts always inspire me! What are the three letters at the top of the gift (DWD)? Hi Cindy~ the initials are the monogram of the couple. Last name begins with W and their first names both begin with D. Thanks for stopping by! What a beautiful & thoughtful gift! Sometimes its the more personal gifts that aren’t on the register that end up being the best ones of all. What a wonderful & thoughtful gift! Sometimes the personal gifts that aren’t on the registry are the best ones of all. Are you going to be offering this in your etsy shop? My daughter is getting married in June and I would love to order one for her! I can frame it myself but have NO skill beyond typing on the computer. Such a great gift! Thank you for the PicMonkey tip! What a lovely gift. There’s nothing like “making it personal.” I have taken a wedding invitation, matted and framed it to present on an anniversary or house gift. Just a thought. This is such a beautiful, thoughtful and personal gift! Ann this has to be the nicest gift to receive. I love home made gifts, and this is a winner in my book! love it and I know she will too.. YOU do amazing work..
How clever! Lovely idea! Love the video. Thanks for sharing. Ann,. this is a brilliant idea! I will definitely use this one! I bet the bride to be will be thrilled! Have fun sewing and listing! What a great personal gift, I love the idea ;) It think Spring is on it’s way here too.